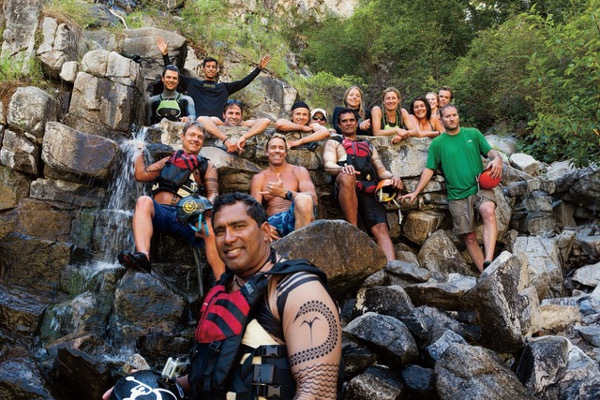 Main Salmon River Rafting Trips - Sandy Beaches & Deep Canyons Ahead! 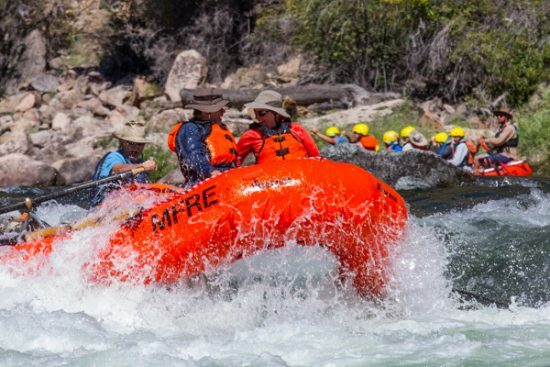 When you are rafting the main Salmon River in Idaho, you have access to the most pristine and untouched terrain in the US, slicing through the 2.3 million acres of Frank Church River in No Return Wilderness Area, the largest roadless area in the country. 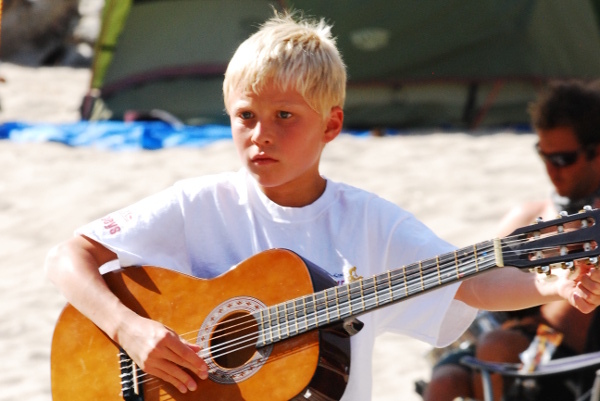 The Main Stem, a major feature in Salmon River rafting trips, is famous for large sandy beaches for camping, warm water for swimming, great trout fishing, fun and easy whitewater, and the best hot spring in the Pacific Northwest. No river displays all these characteristics quite like the Main Stem of the Salmon River. It also boasts a canyon that is deeper than the Grand Canyon. 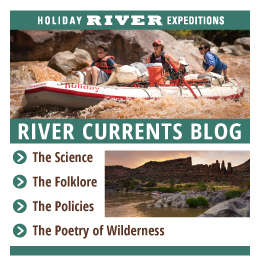 The river has recently become famous as the best stand up paddleboard (SUP) river trip in the world due to its warm water (75+F in August) and fun and safe wave-train rapids. 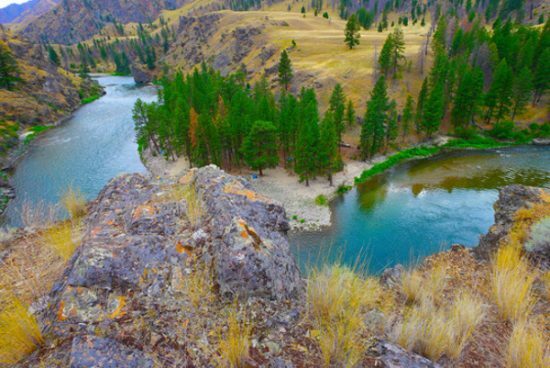 Often called the "River of No Return", the Main Stem of the Salmon River is chock full of historic miner’s cabins, homesteads, and Shoshone Sheepeater and Nez Pierce Indian pictographs and pit houses. The early river runners called the Salmon River the “River of No Return” because the wooden scows run in the early 20th century were scrapped at the end of their journey and used to build many of the cabins you see in the canyon. The Salmon is in-fact a river that'll make you not want to return home while leaving you with the desire to come back time and time again. In a state that’s second only to Alaska in designated wilderness areas, getting from point “A” to point “B” can take some doing. That’s why one of the transportation options is a scenic charter flight from Boise to Salmon, Idaho – gateway to our river put-in. Ninety-two life-changing river miles later we will return you to civilization in McCall. Please arrive in Salmon, Idaho the night before the trip begins. Salmon is a 5-hour drive (1 hour flight) from Boise and a 2-hour drive from Missoula. Please see the section below on getting to Salmon. We have a pre-trip orientation at the Stagecoach Inn (208-756-2919) at 7:30pm the evening before the trip begins. We will get acquainted, answer questions, and have a short orientation to show you how to pack the waterproof gear bags we provide for your personal gear. Lodging at the Stagecoach Inn is arranged on your own. Day One: We meet at 7:30 am at the Stagecoach Inn for a 2-hour bus ride to the Corn Creek, the put-in for the Main Stem of the Salmon River rafting trip. We will stop after 45 minutes to get last minute items (fishing licenses, beer, sunscreen etc.) at the North Fork Store. Upon launching our rafts at Corn Creek we journey into the pristine heart of the Frank Church River of No Return Wilderness Area. We will encounter Killum, Gun Barrel and Alder rapids today, which are all fun class III wave trains. This river calls to adventure seekers, who can choose between the paddle raft, inflatable kayaks or stand-up paddleboards. Or you can ride comfortably on an oar raft in our luxurious “Queen of Sheeba Couch” and take in the scenery. The fishing is excellent for novice and experienced anglers alike. The warm air and water temperatures encourage frequent refreshing dips in the river and we often find guests in calm sections floating next to the rafts. Evenings find us enjoying delicious dutch oven delights, relaxing by the campfire, playing horseshoes, listening to the guides sing and play guitar and watching for shooting stars. Day Two- Day Five: Each day brings new discoveries: exciting rapids like Black Creek, Bailey, 5 Mile, Split Rock, Big Mallard, Elkhorn and Growler rapids, historical sites such as Buckskin Bill’s homestead and Jim Moore’s place (maybe you’ll find the fortune he buried in the hillside! ), and the much anticipated Barth Hot Springs. Visit Barth Hot Springs, known as the best hot spring in the Pacific Northwest. 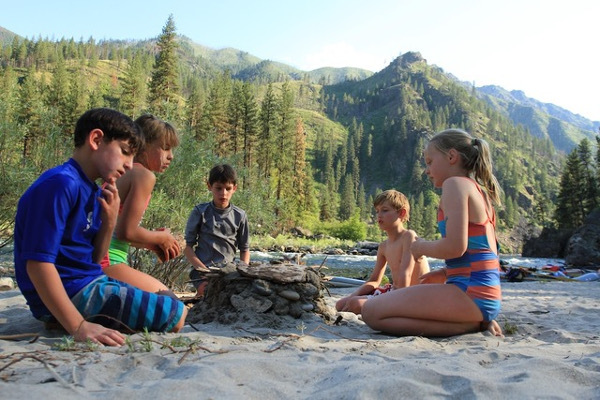 We may stop and visit with several families that live along the river year round and they will share their stories of living “off the grid” in the wilderness and take us on a tour of their homesteads. Visit with Sue and Greg Metz at Yellow Pine homestead, Doug and Phyllis Tims at Campbells Ferry homestead and Five Mile Bar, the home of the river’s most famous resident “Buckskin Bill”. There are abundant hiking options up many of the side drainages. Hike up Indian Creek to visit very rare 2,000-year-old Yew trees, also called the immortal tree, which the Plains Native Americans used to make longbows from the wood. Hikes up Chamberlain or Bargamin Creeks give you another perspective of the river or hike up to Rabbit Point for amazing views. Day Six: We float for 5-10 miles this morning and run challenging rapids like Chittam and Vinegar Creek and arrive at the take-out at Carey Creek around 10 am. Please see section below on “last day of trip” for logistics today. As always, it was a truly excellent trip. Nothing could have been better. Thank you all. 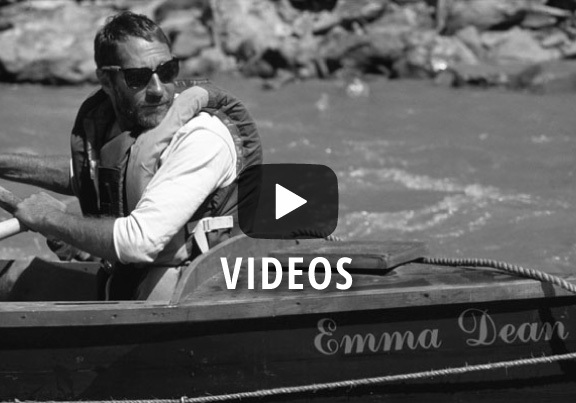 Great new experience on a new river!! The guides and staff were fun and careful at the same time. We always enjoy our Holiday trips!!! What a crew, what an operation, what a river. This experience exceeded my expectations… I assumed it would and I was not disappointed. We will keep our fingers crossed that something wonderful might happen or perhaps Time will standstill for a moment or two and we will get to paddle with you guys once again. Please give them all a high-five and a hug for me, especially Peg leg Pete and Misty. I wish you all a Great and safe rest of the summer and you will be hearing from us again I promise.